There’s an often-cited statistic that 30 percent of first-time visitors get lost in the hospital.That may seem a little high—even to the directionally impaired among us, but when you factor in hospital layouts that feel like they were designed by IKEA and the stress of the visit, it becomes more plausible. The 30 percent isn’t the most striking stat—it’s the impact of lost visitors on the hospital. The time hospital staff spend giving directions—2.4 minutes for each lost visitor—and the cascading effect of late or missed appointments. In the US, missed appointments cost the healthcare system more than $150 billion a year. Doctors in one UK study attributed a significant portion of missed appointments to navigation issues in hospitals. Designing intuitive wayfinding systems with digital signage can go a long way in resolving navigation issues and creating better patient, visitor, and staff experiences. You can’t underestimate the value of patient experiences and, of course, the correlating financial return on investment. As you consider your 2017 budgets, determine whether your current digital signage for wayfinding is sufficient or whether it needs a refresh. Here are two other important uses for digital signage that can help your healthcare facility improve patient and visitor experiences. It’s true. We are impatient people. And sitting in a waiting room is about the longest wait you can experience—no matter how long or short the wait actually is. The good news for technology and facility planners is that you can make that wait seem shorter for your patients with digital signage. A recent study found that digital signage reduces perceived wait times by 50 percent. The content you choose to display can also help reduce anxiety and relax patients as well—both strong contributors to a better overall patient experience. 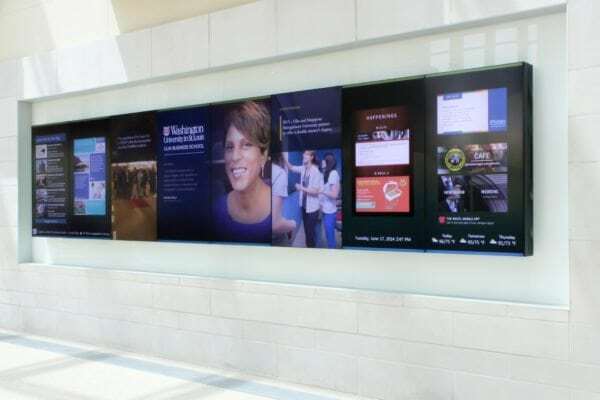 Digital signage provides another strong advantage to hospitals and healthcare facilities as a means to communicate information about the hospital—its services, awards, or news—to patients and visitors in common areas such as cafeterias. Most hospitals are businesses, and advertising your services and presenting messages help reinforce positive opinions about your facility. Using digital signage to guide visitors, occupy waiting patients, and reinforce key messages about your healthcare facility are all great ways to drive positive outcomes and achieve a return on your investment. For more ideas on how to make the most of your healthcare budget, download this eBook: 5 Healthcare Projects to Consider When Planning Your 2017 Budget. If you need to create a clear technology strategy to guide the budgeting process, AVI Systems can help. We’ll conduct a no-obligation assessment that will reveal how long your current technologies will likely last, which ones could use a refresh or even just a repair, and what should be overhauled altogether. Our experts have outfitted hundreds of healthcare facilities and would be happy to discuss your needs.